Reading the title of this post, you may be asking yourself a few questions. Isn't a little late to review Ancillary Justice? Didn't The G already review Ancillary Justice when it was timely? What would be the point of issuing another review? All valid questions! The G absolutely did review Ancillary Justice when it was fresh, but he wasn't particularly impressed and passed on Ancillary Sword last year. However, (not to get too under the hood here) he offered up Ancillary Mercy and I happily accepted, but under the conditions that I could catch up first. We decided it wouldn't be a bad idea for me to re-review Ancillary Justice and issue a review for Ancillary Sword before we get to our review of Ancillary Mercy. So that's where we are today. Ancillary Justice has been out for a couple years, and The G gave an excellent summary, so I won't retread that ground. Read The G's review. I did enjoy Ancillary Justice more than he did. It's a complex story in a big world, which we don't get enough of. It's got class struggle, xenophobia, questions of conscience and sentience, planet hopping, alien species, war, occupation, and more. It's all handled remarkably well, particularly for an author's debut. There were very few moments when I felt like I should have a pen and diagrams to keep everything straight, because the characters and their actions spoke for themselves. I could recognize characters by what they did or how they spoke, which is something that many authors fail to pull off. There is a point maybe 1/3 into the story where two characters are having a discussion about an object of interest. This is where I was really hooked. It was a perfectly balanced suspenseful moment in which I wasn't sure what the outcome would be, but I couldn't stop reading until there was some resolution. All of this from a simple two character discussion. There are mysteries in this world that don't get answered, but I can tell that there are answers somewhere. Maybe they're later in the series, or maybe they just don't get written down, but they exist. This is what makes the very abrupt and anti-climatic ending a big letdown. The conflict at the core of the novel is resolved (to a point), but it happens so fast and with a lot of hand-waving. It doesn't come as a surprise, because endings are hard for even seasoned authors to pull off, but it could've been better. 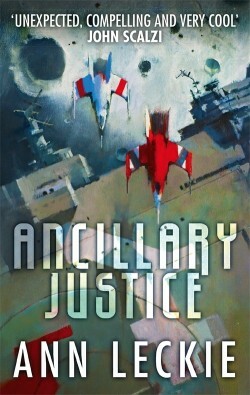 Ancillary Justice is a big, ambitious debut and Leckie made it all work, almost. It suffers a poor ending, but the preceding 3/4ths of the story are excellent sci-fi.